For all academic programs applicants must meet the eligibility criteria for the program. In general, most of our programs are open to applicants with a background in life sciences and / or pharmacy / allied sectors. Applicants must be able to provide evidence of prior education or training such as a copy of degree certificate / marks sheet etc. This must be uploaded during the application process or emailed to us after submitting the application. If you would like to see a sample of the certificate that will be issued to you upon successful completion of your program please click view sample certificate. If you would like to see a sample of the transcript that may be issued to you upon successful completion of your program please click view sample transcript. Note that transcripts are only issued for longer duration programs such as diploma and advanced diploma programs. If you are not sure about which program to apply for or how to submit your application or if you have any questions that can help you make a decision get in touch with us. We would be glad to assist. We offer a 24 hour online support to help you with any questions that you may have before applying or even after you have enrolled with us. The chat support can also provide any required technical support. Q1. Will a diploma or advanced diploma really make a difference to my career? In today’s increasingly competitive marketplace, employers place greater value on training and education than ever before. Employers are looking for employees who have an extra edge over other applicants in terms of education. This holds true for the clinical research and healthcare industry as well. Having formal and specialized technical education increases your chances of getting the breakthrough you are looking for or to grow further in your career. You need something more than just a degree, that extra edge, and James Lind Institutes training programs are your perfect solution. Q2. What courses do you offer? Q3. How much salary can I earn after I complete my course at JLI? Having completed a training program from JLI greatly increases your chances of earning your dream job and to realize your career aspirations. How much you will earn will depend on which job profile you are intending to take up and how well you perform in your given role. Our programs have been developed by industry professionals, are completely industry oriented and fully equip you to excel from the very first day of your job. On request, we at JLI can also provide you with salary ranges for related entry-level positions. Q4. How long does it take to complete a post graduate diploma? It usually takes 6 months to complete a post graduate diploma and about 8 months to complete an advanced diploma. This will depend on which program you are enrolled in and on your individual learning capability. Q5. Is there any application fee? We do not charge any application fee to process your application for admission. You only need to pay your program fee as applicable. To check the total fee applicable to you please use our online fee calculator available in the tuition section of this website. Q6. Do you offer any scholarships? Yes, you may be eligible for scholarship. Visit the tuition page of this website to know if you are eligible for it. If scholarship applications are not being accepted we advise not to wait. There is no guarantee that you will be offered one, so save yourself time by enrolling early. Tiime is money. Q7. How much time will it take for me to get access to my program after I submit my application? After your application form is received by our admission representatives and your program fee payment is confirmed you will receive access to your program usually 1 day prior to the next scheduled start date. Q8. What are the admission requirements? Admission into a program requires the applicant to meet certain acceptance requirements. Eligibility criteria are mentioned in the respective program detail pages. To get admitted you must meet the eligibility criteria and provide proof of eligibility such as a copy of your prior diploma, degree, or work experience as may be required for the program. Q9. Why is James Lind Institute a good choice for me? Q10. Are the programs accredited? 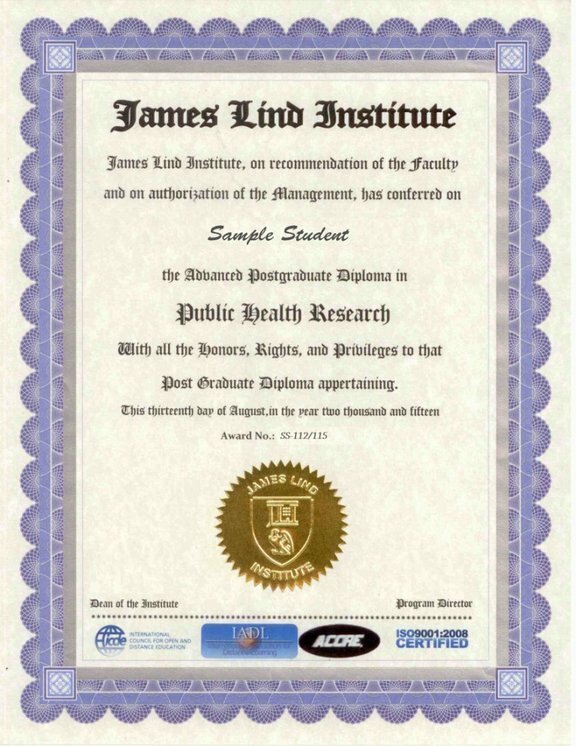 Yes, all programs offered by James Lind Institute are accredited by the International Association for Distance Learning, UK; and the Accreditation Council for Clinical Research Education (ACCRE) USA . Further, James Lind Institute is a proud member of the prestigious International Council for Open & Distance Education which has a consultative partner status with UNESCO. JLI is also fully accredited by the AMERICAN BOARD OF ACCREDITATION SERVICES (ABAS) as per ISO 9001:2008 standards for providing Training & Education Programs related to clinical research, pharmacovigilance, medical writing, pharmaceuticals, healthcare and allied sectors. Q11. What is the difference between diploma, professional diploma, advanced diploma and certificate courses? Advanced diploma programs are longer in duration than diploma and professional diploma programs. Certificate programs are even shorter. Advanced Diploma programs offer a minimum of 32 credits, Diploma programs 22 credits, Professional Diploma programs 18 credits and certificate programs 14 credits. Q12. Can the diploma be evaluated by WES or similar agencies? 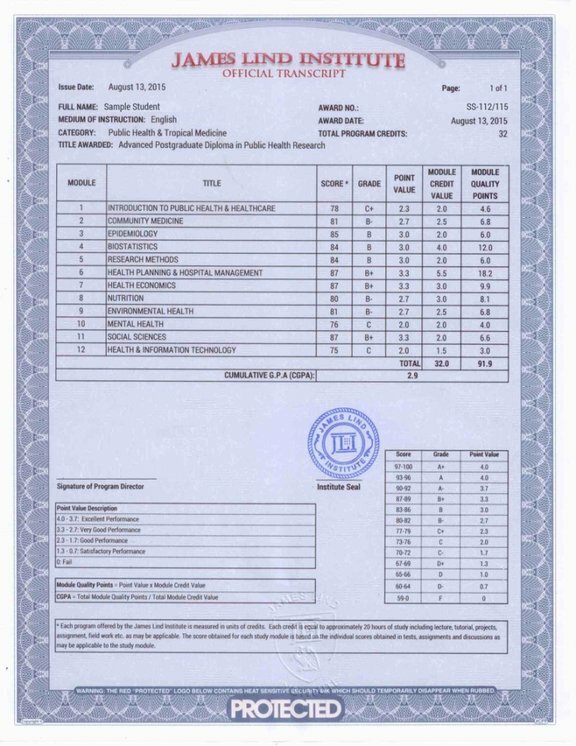 WES is only able to evaluate certificates issued by government universities. As we are a private school agencies like WES may not be able to evaluate the certificates issued by JLI. The masters degrees conducted by JLI can however be evaluated as they are issued by the universities that we partner with.